A classic sandwich with a Caribbean twist. Great source of lean protein and healthy fats. Good idea for grilling on warm sunny days. Mash together avocado and mayonnaise in a small bowl with a fork. Rub JCS Boston Jerk Seasoning on both sides of salmon. Grill until just cooked through, about 3 to 4 minutes per side. Spread the avocado mixture on the bottom halves of each roll. 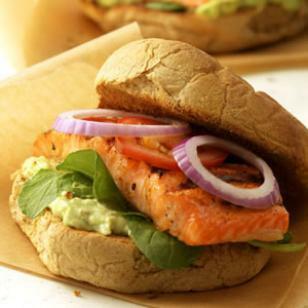 Top with the salmon, arugula, tomato, onion and condiments of choice.